Argao Vice Mayor Stanley Caminero, whose family owns the mountain retreat, said it is in the mountainous barangay of Linut-od, which is an hour away from the main town center. We asked for more information about the underground exploration, and he told us that it happens in a demo tunnel used by miners for their safety training. This demo tunnel is 70 feet below the ground and 475 feet in total length, according to a Coal Mountain Resort brochure. 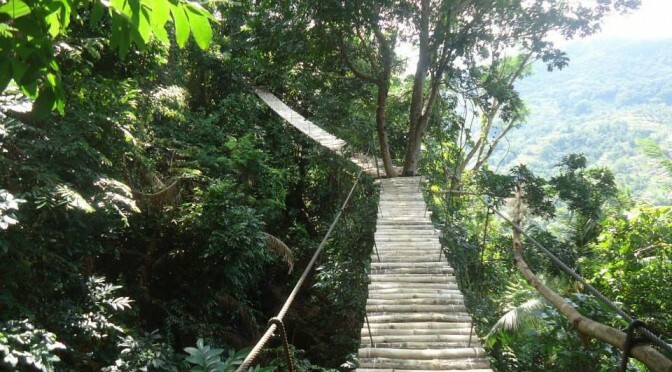 One of the interesting activities at Coal Mountain Resort is a walk on the hanging bridge built on the forest canopy. (Photo taken from Coal Mountain Resort Facebook page. Visitors have the option of going down in complete mining gear and paying P80 or doing without for P30. Coal Mountain Resort appears to be very interesting the way the vice mayor described it, and we’re already planning our visit. The vice mayor said there has been a lot of interest in overnight stays and rooms, which can accommodate a maximum of 50 persons, are usually full. To ensure that you can be accommodated, the safest option would be to book a room a week in advance, he added. Accommodations come in three kinds: rooms with twin beds that can accommodate four persons for P1,000 a night, rooms with common shared bed good for six persons at P1,200 a night, bahay kubo good for four persons at P1,000 a night. Coal Mountain Resort is located 468 meters above sea level and used to be a grazing ground for carabaos owned by the Caminero family. In the 1950s, farmers discovered and started mining coal in the area and neighboring sites. Underneath the resort, a network of tunnels still exists which is why the family decided to call it Coal Mountain. Coal Mountain Resort offers transport services, either from Cebu City or Argao town center, with the following fees. For more information, check out InnoPub Media’s mobile web guide to Argao or download the Android app Argao guide. The guides contain a listing of places and activities of interest in the town as well as important contact numbers.